Line a clean margarine or similar container with paper towels and place the baby in it. This will provide support for the bird and mimic the comforts and feel of its nest. Keep the chick secure and warm in a box / container. UNLESS the chick is fully feathered, the temperature in the box should be between 80 and 90 F. A lamp with a 40 or 60 watt bulb should provide enough heat, but don't put the lamp directly over the bird. Baby chicks should have enough room to "self-regulate" their temperature. They should have enough room to either move away from the heat source or closer -- their own comfort level will dictate that. Make sure it doesn't get over-heated. If it starts open-mouth breathing or its neck is outstretched, it is too hot. Cover the box to cut down on disturbance to the bird, eliminate drafts, and prevent the bird from getting out of the box. 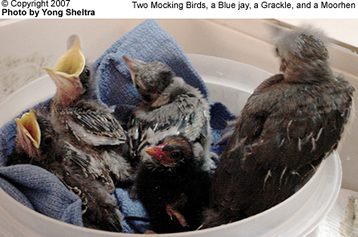 Provide emergency food for the baby bird. Soak dry cat food in water until it is completely wet and soft. Break the food into small pieces and place them in the bird's mouth. The wet cat food will provide all the liquid necessary. 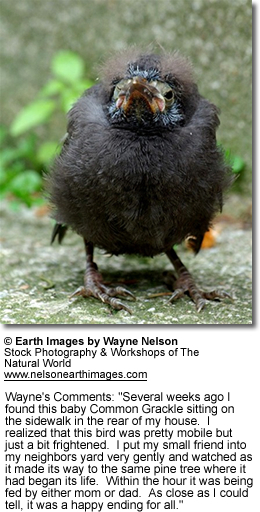 Nestlings require frequent feedings, as much as every 30 minutes from dawn to dark. Note - the above only applies to seed and insect-eating bird species only- NOT to hummingbird (nectar-feeding) bird species that have different dietary requirements. It is recommended that you consult with someone experienced in the rehabilitation of hummingbirds. Water: Do not try to get the baby to drink water. Handfeeding Bird Chicks - applies to seed or insect eating bird species only. Not applicable for hummingbird chicks that have different dietary requirements. Contact an experienced wildlife rehabilitator with knowledge of hummingbirds.